The other day while researching some background material for an article I was working on, I found myself digging through the archive boxes that contain my old copies of the Comicopia APA I belonged to for many years. APA stands for Amateur Press Association. It is a fanzine dedicated to a subject, or a group of subjects, with one person acting as a Central Mailer/Distribution Manager (or CM/DM for short). Basically, every member puts together their own newsletter/fanzine about the subject. This can contain discussions, reviews, editorials, news, and Mailing Comments- discussion about the work of fellow members. Similar to on-line discussions, only with a longer time-lag. 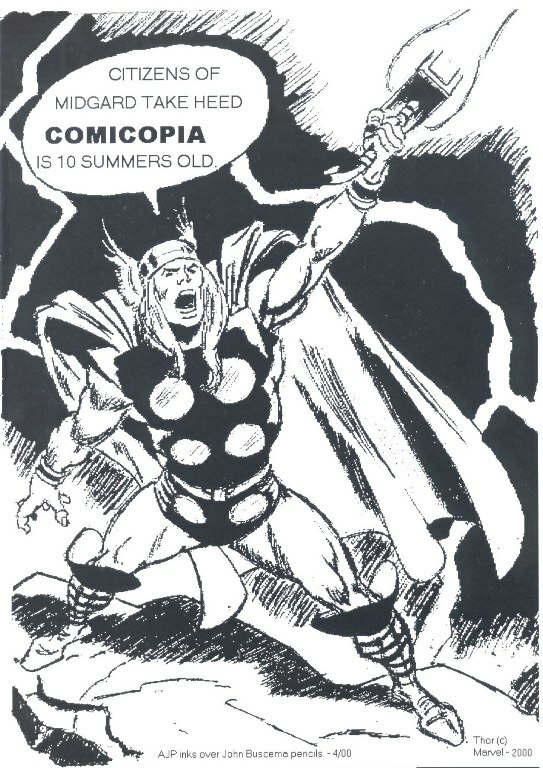 I was a member of the Comicopia APA for just over 8 years and contributed to about 50 or so issues if memory serves. Many of my fellow APA members became, and remain, life-long friends. Although I’m primarily a writer, I have a times dabbled with the idea of trying my hand at inking comics, as well as drawing the occasional character piece. Comicopia was a place for me to practice and get feedback, and over my time there I contributed about 14 pieces of art for either front or back covers. Digging through the boxes the other day sparked an idea that it might be fun to repost some of that art on my blog. Done in 2000 to celebrate Comicopia’s tenth anniversary issue, an early attempt to do some inking over the great John Buscema’s pencils. I haven’t done this in a few years, so thought it was about time I did an updated list of various places to find me online. Alan J. Porter – Writer of Stuff. Wheel Spin! – For my motorsports obsession. The James Bond Lexicon – News and notes on James Bond. Comic Encounters – Occasional comics related posts. AJP Notes – Mainly a place to post various bits of story research. I Can’t Keep (Not) Blogging Like This…. New Year’s Day – A time for looking forward to what the next 12 months will hold. A chance to make plans, set goals, and stride forward into the future. Also a time to reflect on the last 12 months and decide what you can do differently in the year to come. Looking back I was amazed at, despite best intentions, how little I posted anything to this personal blog. A measly 5 entries in a year. Not good enough, Porter. There was a time, back in the old Live Journal days, that I used to blog almost every day. I’m not sure I will every get back to that level, as Facebook, Twitter, and Tumblr have taken on the role of places to capture short notes, thoughts, and observations – but I can certainly do a lot better than a post approximately every two months. Goal #1 for 2014 – Blog more. It’s as simple as that.